Has your business already delved into the world of automation? Through allocating resources and assigning tasks, you and your employees can avoid bottlenecks and wasted time while also improving the efficiency of your business’s daily operations. While some companies are afraid of automating tasks that may be too delicate, there are many day-to-day items that could be processed through the business software and thus eliminated from your hectic workday. For ideas on which items to use this for, check out the graphic below for five business automation process areas. These are great areas to start process automation in your business with WebToGo or similar solutions. You can think of them as security measures that can help your supply chain operate smoothly in case something goes wrong. When implemented in Back Up and Restoration, you save time on having to take manual backups, improving corporate performance management. Furthermore, the automation services can provided much needed automated reporting for those occasional manual checks. Of course, you can set up alters for your business process management. 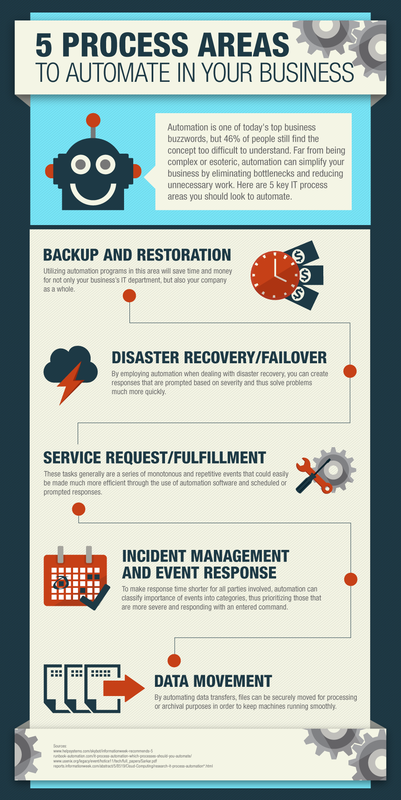 Check out this infographic below on other great suggestion to implement business automation. Why should you automate your business? It is simple. There are many benefits to business automation. However, one of the most valuable is that it lowers costs associated with human error. Every year, businesses waste an incredible about of capital on manual errors. Automating business processes takes away the chance for manual errors, just like surveillance technologies take away the chance for robberies. You will also save money wasted on human inefficiency. When you rely on employees for certain workplace processes, you are paying for every second they are there, whether they are operating at maximum efficiency or not. With business automation, there is no variance. You can be sure that your business is operating at maximum efficiency and production, always. That is a considerable advantage. Business automation allows you to save money to reinvest into other areas of business, and that is never a bad thing. If you want to implement automation properly, you need to help your employees learn how to adopt new automated processes. Otherwise, any automated solutions you implement may wind up slowing things down instead of speeding them up. Provide training and have all the proper change management processes in place, even if you are only changing document management systems or some other small detail. This will help you to automate your business effectively and efficiently to get the most out of new processes. Very good article. I’m dealing with some of these issues as well. That is a very good tip especially to those new to business. Short but very precise info… Many thanks for sharing this one. A must read article!